Ever wish you lived back in the Little House on the Prairie Days when doctors still made house calls? I sure do. I barely have time to walk down the hill to bring up my garbage before the next trash day, let alone sit in a doctor’s office for hours waiting for an appointment. I have a regular doctor that I see for medical issues, but he has really funky office hours. I also kind of need a therapist. I suffer from reverse seasonal affective disorder. Or maybe it’s still SAD, just not with the season everyone expects. Summer gets me down. Winter makes me happy. I’ve always been a little different! Unfortunately, I have a really hard time committing to therapy appointments. I used to be better, but I experienced a trauma a little over a year ago. Now I have PTSD and it’s affected me in more ways than you really want to hear. Super duper long story short, I sometimes need someone to talk to who isn’t directly related to me in some way. Enter American Well, better known simply as Amwell. 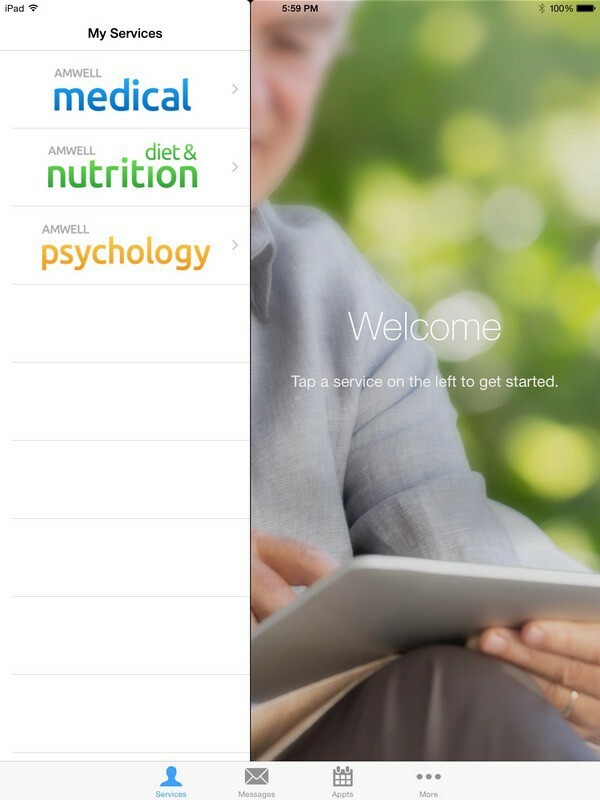 Amwell is the most popular consumer telehealth app in the world. It’s incredibly easy to register and install the app. I downloaded it on my iPad, but you can also use the desktop site. 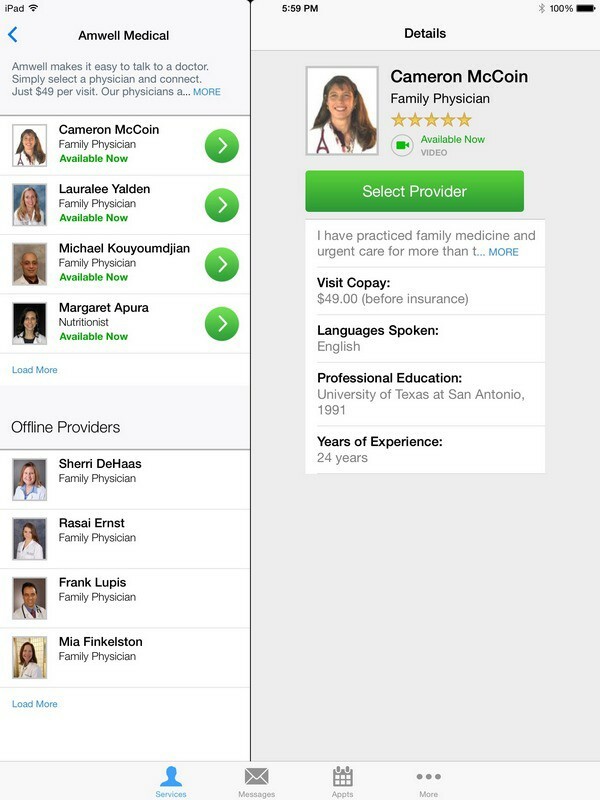 Once you’ve installed it, you can select from physicians, nutritionists and even therapists. Then you can “visit” with them from the comfort of your own home. They’re all board certified, licensed doctors that are allowed to practice in your state (you choose your state when you sign up). Once you’re in, you can choose which scope of practice you need: medical, nutrition, or psychology. The medical doctors available to me are all family physicians, which means they’re capable of dealing with a range of minor illnesses. These include things like bronchitis, sinus infections, seasonal allergies, upset stomachs, colds and other things that you’d call in to your doctor about. Obviously, if you’re having a medical emergency, you should go to a hospital. I like that you can view the doctors before deciding which to go with. Pick a doctor on the left and you’ll see details like how much experience she has, where she went to school and a little bio. I love that you even see pictures. It helps me get a better feel for the person behind the white coat. Yes, you can’t judge a person by a single picture, but still, it helps put me at ease more. Once you’ve chosen a doctor, you can video chat with them to go over your symptoms. They can even prescribe some types of medications for you, depending on your state. They can’t prescribe things like narcotic pain relievers, muscle relaxers or anything else that requires a written prescription, but they can cover just about anything else. You’ll get 10-15 minutes with a doctor, about the same amount of time you’d get in a doctor’s office. The psychologists work along the same lines as far as video chats go. The only major difference is that they can’t prescribe meds, at least not the ones on my list. Only a psychiatrist can give you medication. Counselors and psychiatrists can’t. Still, I did it just to have someone to talk to for 45 minutes about some of the things that are bothering me. Plus I got to sit on my own couch! Want to try Amwell yourself? Use the coupon code MOMSLOVEAMWELL to get a free visit with a doctor, nutritionist or therapist. Doctors are online 24/7 and you’ll never need an appointment. It’s like the ultimate walk-in clinic, except you don’t have to drive- or walk- anywhere! Your visits are secure and HIPPA compliant. Visits cost $49, and many insurances cover part or all of the cost. Stop self-diagnosing and give yourself peace of mind anytime. 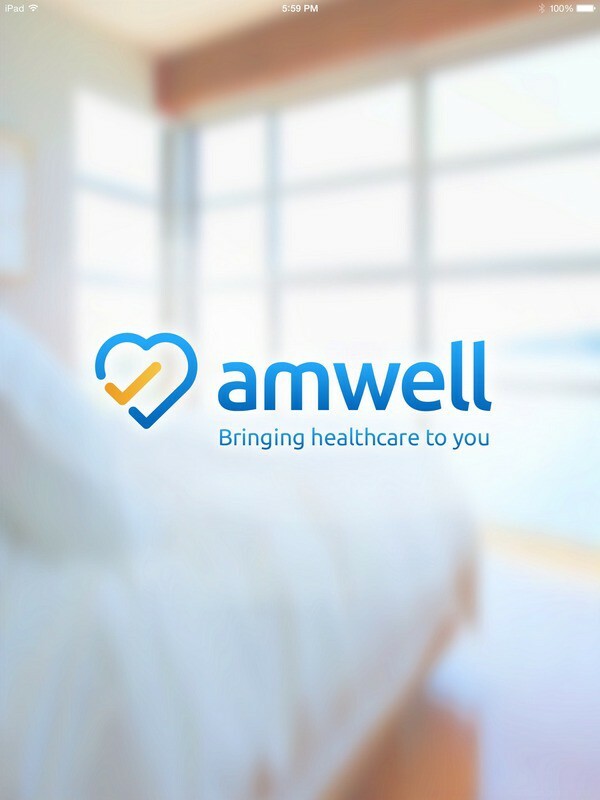 Enroll with Amwell and bring back the house calls! Don’t forget to use your coupon code for a free visit. What do you think is the best thing about Amwell? Tell me in the comments. I think the price is the best thing about Amwell, and that I can get taken care by a Doctor online and not have to leave home. This is such a great deal and in the winter when it is hard to get out, I can talk to a doctor online and get fast help! I keep hearing so much about this. I need to try it out! Technology can be so amazing, the world we live in is always evolving. It is amazing that we can digitally have house calls! What an awesome age we live in! I have had times that I could have used a doctor real quickly. This app would have been really handy then. It could be a real lifesaver for someone that is in really bad shape and needs help immediately. I think this is a prime example of technology at its best. Telehealth is such an awesome concept. When I was finishing my graduate studies, I did a paper on this. At the time it was just on the horizon. Its great that it finally has come to fruition to help the underserved populations. I like this idea. I can imagine a lot of scenarios that I would use it. I love how technology allows things like this. This is awesome! Imagine what technology can bring , right? For sure many will find this truly convenient and helpful. I love this idea! I have a terrible time getting to my doctor because of my work hours so having an extra resource like this would be amazing. I especially like this idea for traveling. It would be nice to be able to get some medical advice on the fly like that. I’ve seen this around and it does sound like a great service. I hate going to the clinic. I used them to talk about nutrition. I was very impressed! This is a great app. I love the idea of being able to see a doctor 24/7 and for only 45!